Originally released in France, "La Zoubida" is in fact the name of a French humorous song by "Vincent Lagaf'", who also released "Bô le lavabo" around the same time. 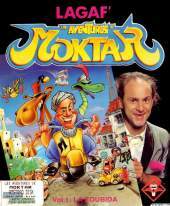 Still, Lagaf' quickly quit comedy and song to turn to TV shows, so a volume 2 of "Les Aventures de Moktar" was never released. 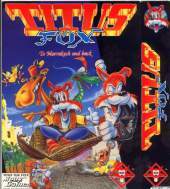 For international audiences, the main character of an Arabian man in the game was changed to Titus The Fox (the mascot of the developer) but otherwise the game is exactly the same. His beloved Suzy has been kidnapped on the other side of the Sahara desert, and to get her back he has to advance through 15 levels (with codes for each one) comprising of nearly 1000 screens of platform gameplay, scrolling in 8 directions. There are secret rooms to find, and bosses at the end of each level. The player can also interact with many parts of the background. Using available objects such as springs and crates correctly is often vital to progress. Alternate modes of transport such as Magic Carpets and Skateboards also make an appearance.